The Honda City can be had with a 1.5-litre (100PS/200Nm) diesel engine and a 1.5-litre (119PS/145Nm) petrol engine. However, it's only the petrol engine that is available with the option of a manual or a CVT gearbox. The diesel engine is available only with a 6-speed MT. Despite being powered by the same petrol engine, the City MT and CVT are bound to perform differently in real-world conditions, as we’ve seen before when we compared fuel efficiency of both these cars. Let’s see how much difference a transmission can make to its performance now. 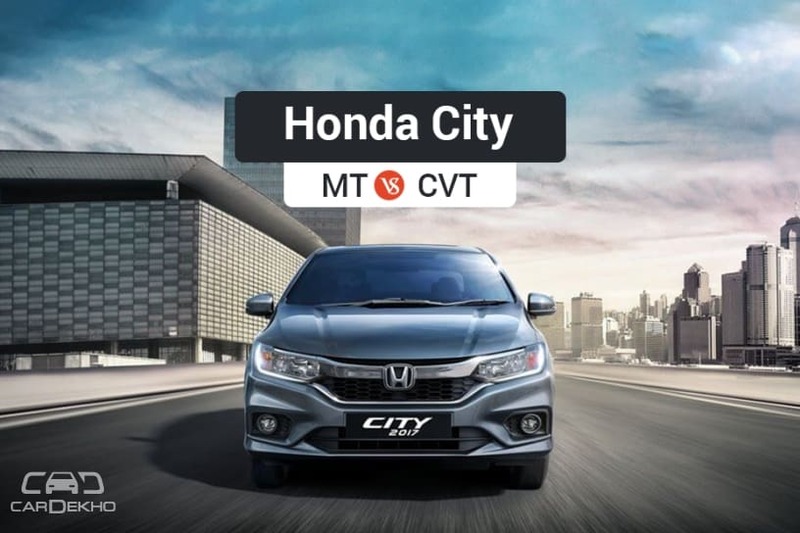 In our tests, the City MT outpaces the City CVT convincingly. It beats the City CVT to the 0-100kmph mark by 2.26s. It is also faster in the quarter mile drag race as it completes it in 16.77s, 1.65s quicker than its CVT counterpart. The MT’s supremacy over the CVT is due to the fact that CVTs don’t have fixed gear ratios. So, when you put the throttle down on a CVT, the engine revs up, but then the transmission takes time to adjust the pulley/cones to build speeds. While in MT, the engine speed is coupled via gears to the final drive so the engine and the wheels pick speeds together. Thus a car with an MT is bound to be faster to the 100kmph mark than a car with CVT. Both the cars are equipped with disc brakes at the front and drum brakes at the rear. Despite that, they perform differently in our tests. It was the City CVT that took less distance to come to a halt when braking from 100kmph and 80kmph. This comes as a surprise considering that the City CVT is heavier than the City MT by 23kg. However, since the difference between the braking distance of the two cars is marginal, there could be other factors such as tarmac quality, tyre life or even driver weight affecting the final results.